You are here: Home / Blog / Food & Drink / Game On! From October 1st, we have been offering our guests some wonderful local game, as supplied to us by Ridley’s Fish and Game merchants. Based at Acomb near Hexham, Northumberland, and recommended by Rick Stein, this family-run concern was established in 1991 and has become known for outstanding quality and service. The pheasant season runs from 1st October to 1st February, and we like to use this lovely local produce on our evening meal menu. 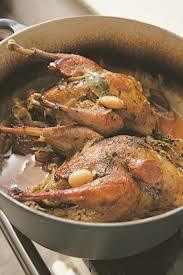 Locally sourced from the Chipchase Estate, Northumberland wild pheasant has a mild taste. The meat is white, like chicken, but has a more complex and subtle flavour, and is very lean. Kevin slow-cooks the pheasant and locally sourced partridge on the bone to maximise flavour and then strips the meat, serving it in a rich game gravy with chorizo – perfect to enjoy in the comfort of your room after a day spent exploring Northumberland!